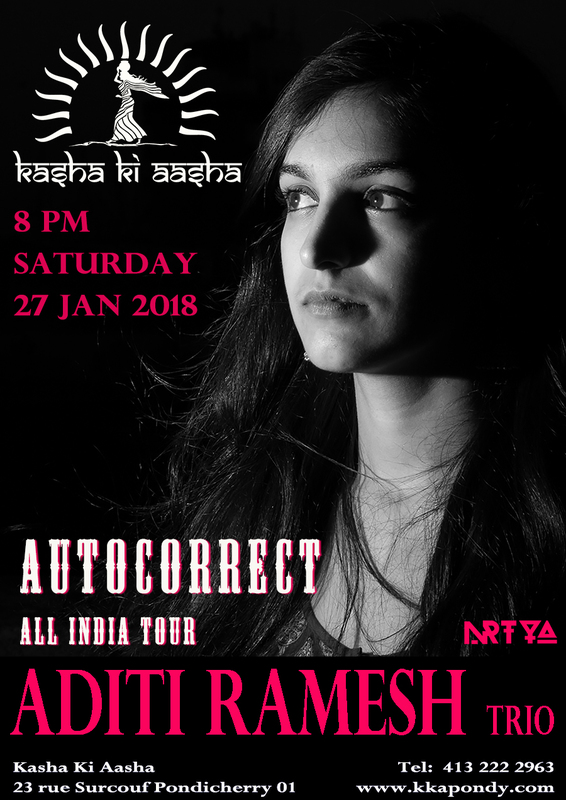 This Saturday, Kasha Ki Aasha welcomes the Aditi Ramesh Trio to our breezy roof terrace as they bring the AUTOCORRECT All India Tour to the south! 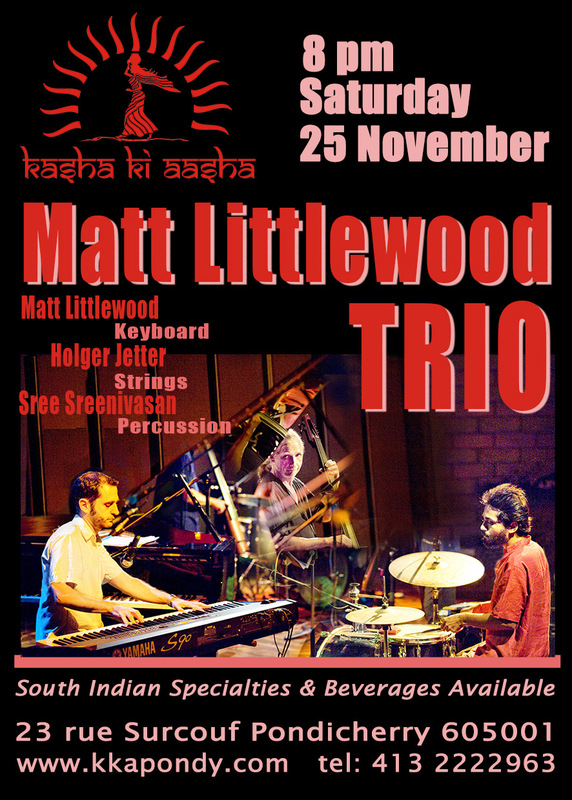 Don’t miss this great musical performance by one of Mumbai’s best vocalists of the new generation of musicians! 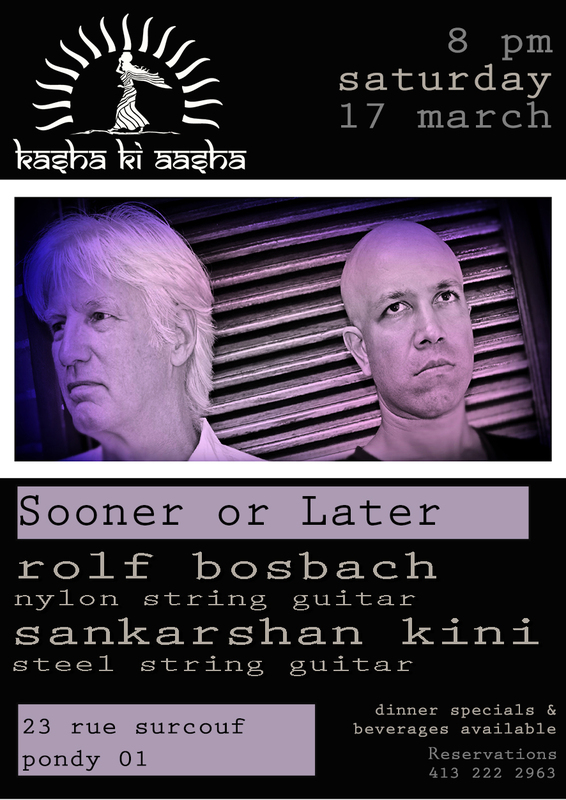 Performance starts at 8 pm and there is no better place to enjoy great music, great food and great people than Kasha Ki Aasha. Reserve now at 413 222 2963. Aditi Ramesh is an exemplary vocalist, songwriter and producer with a herculean voice complimented by a range of techniques and tonal modulations. 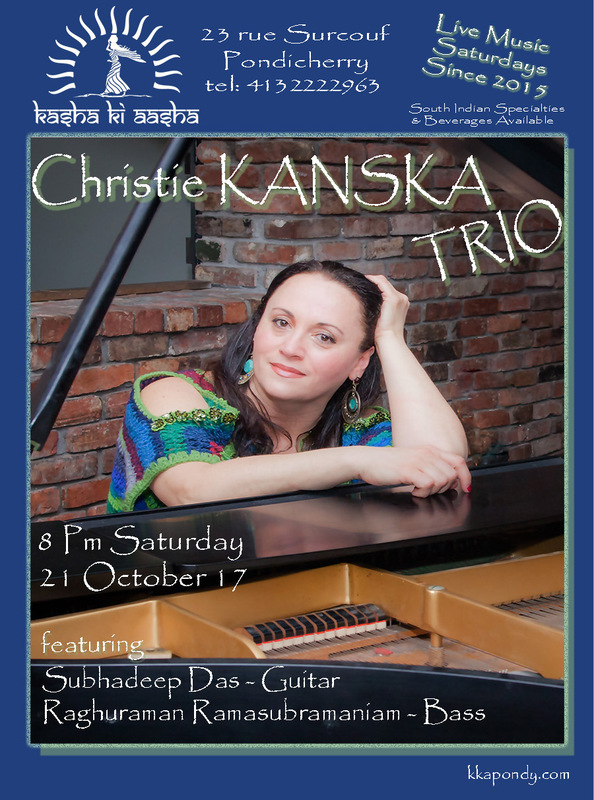 Having been inspired by the blues, jazz and traditional carnatic music in which she has been trained in her childhood, her organic exploration into different genres ever since has been a hallmark of her development. Formerly a corporate lawyer at AZB, the top law firm in the country, since quitting in the end of 2016, her musicality has experienced exponential growth in her soundscape, with her performance incorporating electronic drums and live keys, in which she has been classically trained in western music theory for about a decade. As well as her use of her eloquent voice as an instrument, used to create symphonic harmonies and intricate melodies. The context of her music can best be described as the usage of the mundane, as a foundation for depicting the nuanced realities facing everybody on a recurrent basis, while at the same time having a sonic content which provides funky, groovy and melodic resolutions. This sort of juxtaposition truly exemplifies her perspective of not taking oneself too seriously, as do her frequent, and at times inspiring, bouts of daydreaming. Also known to hone extraordinary culinary skills, she’s a favourite at fleas, Kitsch Mandi (Bangalore) and the Lil Flea (Mumbai) to name a renowned few integrating her pop ups with exhilarating music performances. This is a big weekend in Pondicherry and we are bringing in someone special to celebrate it! 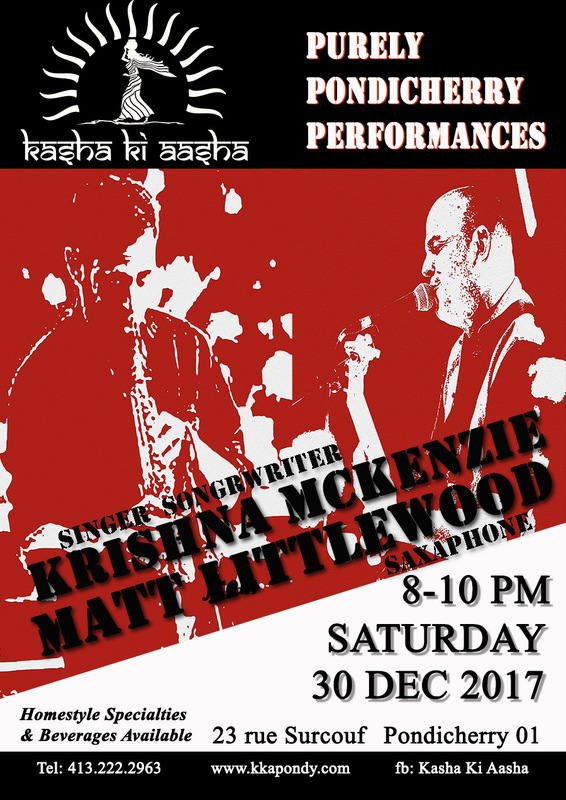 Krishna McKenzie, lead musician of the internationally touring band EMERGENCE will be on stage at Kasha Ki Aasha backed by the well known saxaphonist, Matt Littlewood. Come enjoy Krishna’s Indie Pop style original compositions in just one more edition of the Purely Pondicherry Performance Series on Kasha Ki Aasha’s breezy terrace! 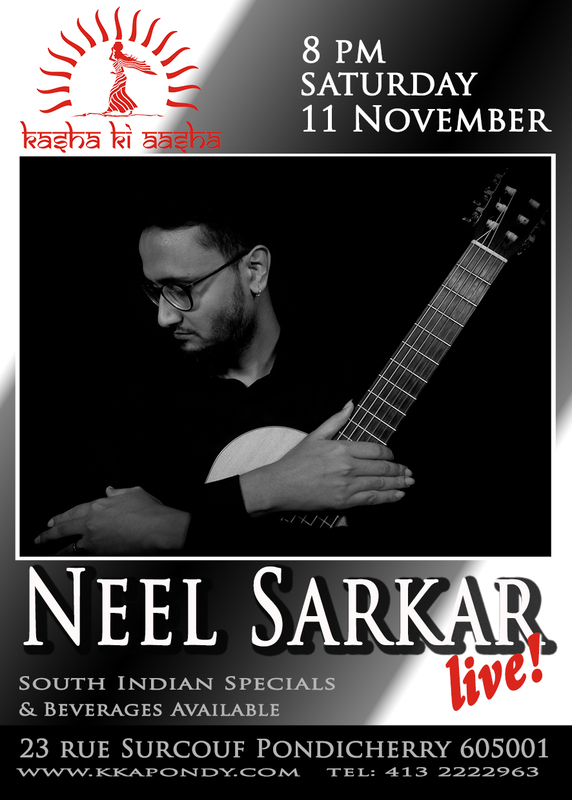 Kasha Ki Aasha is thrilled to welcome soloist, Neel Sarkar to our terrace this Saturday evening. Neel is currently on tour promoting his new recording SOLILIQUY. Music starts at 8 pm and we are sure you won’t want to miss a minute of it! Neel Sarkar is an Instrumentalist and composer from Barrackpore, a suburban Bengal town near the northern fringes of Kolkata. Born in 1980, he started his musical journey at an early age of nine. His first instrument was the tabla, a popular Indian hand drum in which he received training in the Farukabad Gharana. At the age of seventeen, he chose the guitar as his primary instrument under the influence of musicians like Al De Meola, John Mc Laughlin, Miguel Czawohski, Allan Holdsworth and others. 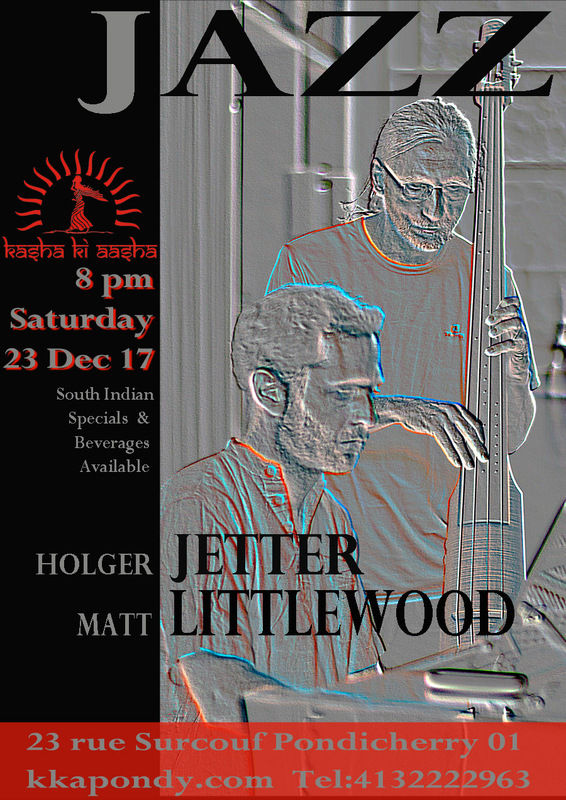 Gradually, his influences also came to include stalwarts of the Hindusthani Classical scene like Pandit Ravi Shankar, Ustad Zakir Hussain and Pandit Nikhil Bannerjee as well as many other instrument players from all around the world like Victor Wooten, Vladishwar Nadishana and John Coltrane. 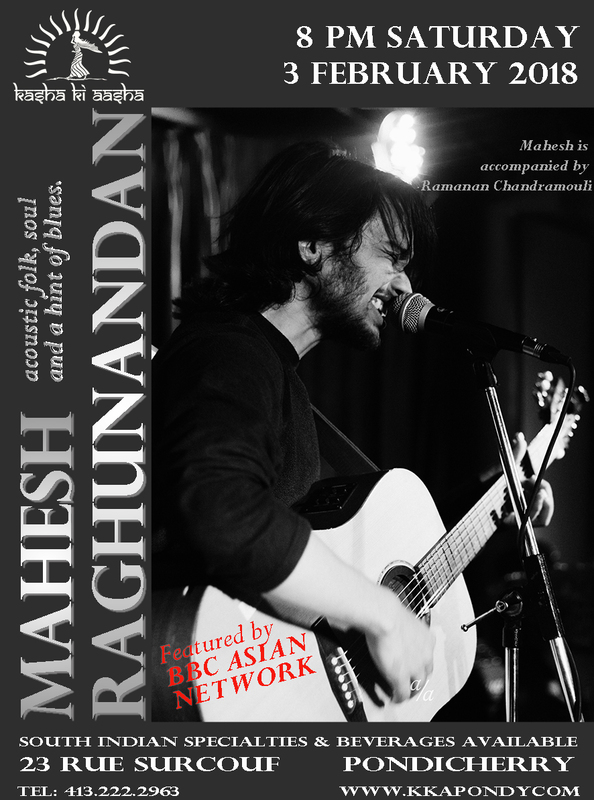 Shaped by various trajectories of musical genres and styles, his style of playing has come to reflect a mix of Hindusthani Classical melodies and flamenco rhythmic textures underscored with an essence of Western jazz harmony. Apart from composing and playing his primary instrument,he is under the tutelage of Pandit Shantanu Bhattacharya’s talim(Patiala Gharana) in Hindustani classical music, he can also play other string instruments like Persian Setar, ukulele, guitalele and the Dotara as well as some percussion instruments like tabla, dubki, khanjira and cajon. On the side, he has become used to handling keyboard programming and background scores for ad films, animation films, short films etc. Neel started his journey as a professional musician working as a faculty of London College of Music (LCM). He pursued a simultaneous career performing with various local bands and got exposed to different genres of music like Rock, Pop, Modern Jazz, Latin and Flamenco. While spending most of his free hours practicing, Neel developed a deep spiritual connection with his instrument. In 2007 he decided to move away with his guitar from the urban cacophony to the countryside and started to write and compose songs for himself. 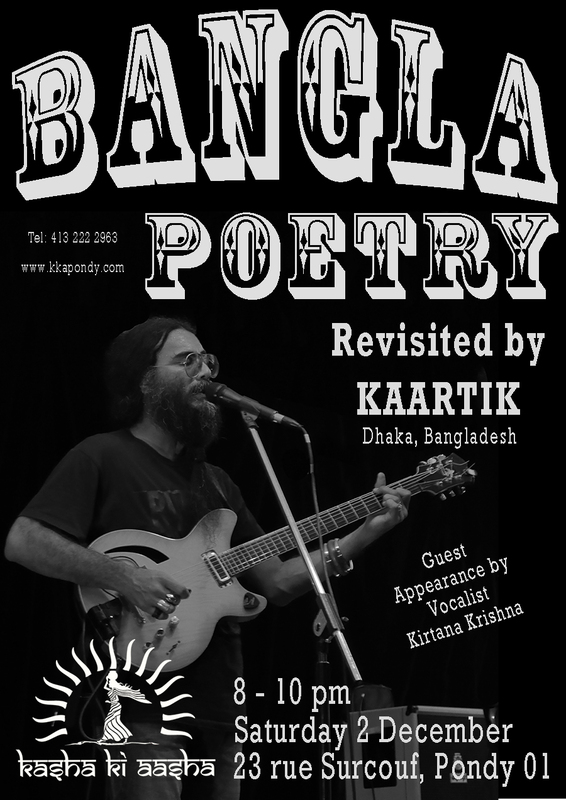 After returning to Kolkata, he started looking for like-minded musicians to collaborate and perform with. Later he came up with his own instrumental independent musical project called NEEL SARKAR PROJECT (NSP). 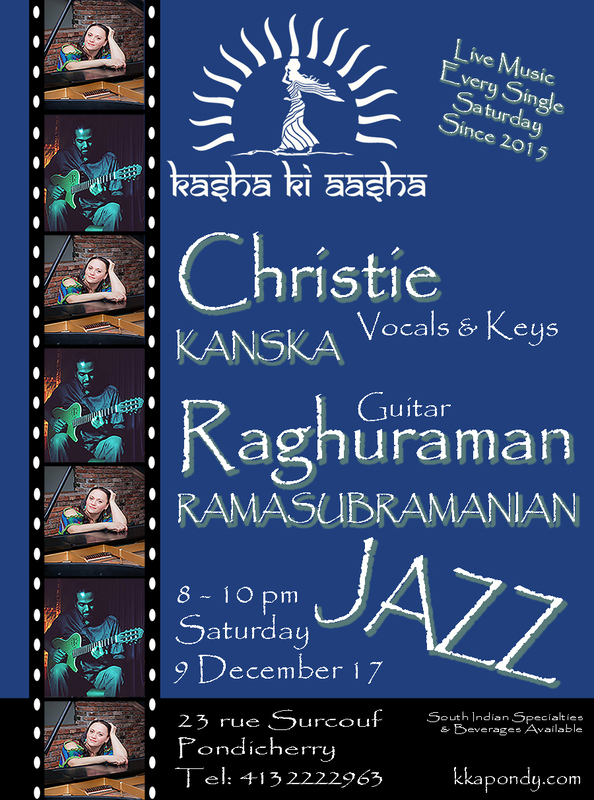 Kasha Ki Aasha is at 23 rue Surcouf Pondicherry 01. Call for reservations at 413.222.2963. Dinner and Beverages are available.